Frances Widdowson (Offended by Offence) has recently reviewed this book on her blog. I liked her review and also the Kirkus review at amazon books. I haven't read the book. These brief notes are based on the reviews. Taken separately and in particular when combined these outlooks undermine the pursuit of scientific truth by introducing a variety of mental and ideological barriers to free and open discussion. This is explained more in the reviews. Irrespective of other concerns (safety, disposal, proliferation of weapons) the generally accepted wisdom about the cost of nuclear generated electricity is that it is more expensive than electricity from coal or other fossil fuels. According to Cohen it was accepted wisdom by the utilities in the USA before the over regulation of the 1980s that nuclear would be cheaper than coal and would replace coal. "Many utilities seek cost analyses from economics consulting firms, some utilities have their own in-house economists to make estimates, and banking organizations maintain expertise to aid in decisions on investments. From the early 1970s until the early 1980s, all of their reports found that nuclear power was the cheaper of the two. For example, the Tennessee Valley Authority (TVA) is the largest electric utility in the United States. Its profits, if any, are turned back to the U.S. Treasury. It maintained a large and active effort for many years in analyzing the relative cost advantages of nuclear versus coal-burning power plants, consistently finding that nuclear power was cheaper. The 1982 analysis by the Energy Information Administration, a branch of the U.S. Department of Energy, was the first to find that coal and nuclear were equal in cost; their previous analyses found nuclear to be cheaper. By 1982, these analyses were mostly discontinued, since it seemed unrealistic for a utility to consider building a nuclear power station, or even to hope that it could be done without regulatory turbulence"
Tom Blees also discusses and updates answers to these questions in his book Prescription for the Planet. One of the important points he makes is that the modern reactor designs (Gen III and Gen IV) employ passive safety using molten sodium as a coolant and consequently do not have to operate under high pressure, except for the steam portion of the system in the turbine room. This means that significantly fewer valves, pumps and tanks are required compared with the older reactors. This lowers construction costs. The other main point made by Blees about high costs in the USA (compared with France and some other countries) is that the nuclear industry there has yet to agree on a standard design and each new design has to jump many regulatory hurdles all of which pushes the cost of the process higher. Thanks to Barry Brook's blog I recently attended a debate in which Tom Blees participated. Subsequently, I bought a few copies of his book and have distributed them to friends who are interested in discussing these questions. I notice that the Obama administration has just announced a loan guarantee intended to underwrite construction of two nuclear reactors in Georgia. If the project goes forward, the reactors would be the first begun in the United States since the 1970s. From what I have read I conclude that electricity from nuclear power could be as cheap as electricity from coal. update 4th March: After a fair bit of discussion on threads at Strange Times (Technology, development and c... c... c... climate change) and Brave NewClimate (Do climate sceptics and anti nukes matter?) I have changed my mind again. In general nuclear is not cheaper than coal unless extra costs such as a carbon tax are (in the future) added to coal. The fission of an atom of uranium liberates about 10 million times as much energy as does the combustion of an atom of carbon from coal. I fear that to many people, the impression made by saying 10 million is about the same as if I had said 10 thousand or 10 billion. One cannot understand policy issues without taking numbers seriously. If the number were 10 thousand, we probably could not afford nuclear energy. If the number were 10 billion, there would be no need for a significant uranium mining industry, and the waste problem would be trivial. In another part of his site McCarthy quotes figures from Bernard Cohen demonstrating that nuclear energy can supply human needs for billions of years into the future. Although there is no reference to Bartlett type exponential growth here (which is not maintained in real life indefinitely, anyway) the calculations do demonstrate that there is no scientific reason to fear an energy deprived future. I'd forgotten a lot of my basic physics, so here is a refresher. To obtain electrical energy then multiply the power * time. The UNITS here could be joules or watt.seconds. The normal units for larger amounts of electrical energy are KW.hrs. To convert watts to kilowatts divide by 1000, to convert seconds to hours divide by 3600 or 60*60. We need to have an internalised way of having a feel for these values. A joule is the energy or work required to lift a small apple one meter straight up. If you perform that action in one second then that is equivalent to a watt or joule/sec of electrical power. A 40 watt incandescent light bulb produces forty joules of energy per second or the equivalent of lifting 4kg of apples 1 metre in one second. Fluorescent or LED lights achieve a similar effect with much less energy. How much energy does a 40 watt incandescent light bulb use in one day? How many wind turbines would it require to meet the energy needs of everyone in the UK? How many nuclear power stations would it require to meet the energy needs of everyone in the UK? Answer = 300. The UK currently has 10 nuclear power stations. David MacKay is the author of Sustainable energy - without the hot air. He has recently been appointed the UK's Department of Energy and Climate Change Chief Scientific Advisor. Debate: "Should we consider Nuclear Power as a response to climate change?" Tom Blees, President, Science Council for Global Initiatives and author of the book "Prescription for the Planet." Dr Mark Diesendorf, Deputy Director, Institute of Environmental Studies, University of New South Wales". Mark Diesendorf was energetically aggressive in his attack on nuclear power as an "idealistic fantasy". He argued that renewables could completely replace fossil fuels by 2030 and presented a slide showing the growth of various renewables illustrating how this could be done. I felt this slide was dodgy but didn't know enough to refute it. Mark also made a big issue of his expertise and criticised Barry for pronouncing outside his field of primary expertise. Aspects of this slide were challenged by Barry Brook. How could geothermal grow so quickly when on another slide Mark had shown geothermal at the R&D stage in Australia and that new technologies took 40 years or so to reach large scale commercial stage. Mark had used this to argue that IFR (Integral Fast Reactors) was pie in the sky, so Barry's counter was quite effective. David and Mark were unreasonably dogmatic in their anti-IFR stance. The issue of urgency was used in an irrational way, given the reality of the failure in Copenhagen and the certainty of developing countries like China and India to continue using massive amounts of fossil fuels. Even if IFR does take 50 years to develop on a large scale (in itself debatable) then that is not a reason not to develop it. There is a can do and a can't do mentality and wrt IFR their attitude was totally can't do on technical grounds alone. They want a total roadblock on nuclear power. They spent quite a bit of time on this, irrespective of their other objections. Barry took a realistic economic approach that coal would not be replaced by alternatives until a cheaper alternative emerged - and the best shot for that was nuclear. Mark disputed that but admitted that his renewable futures would be more expensive. For me this was the real "idealistic fantasy", his repeated statement along the lines that people power would convince governments to change. The other main objection from the anti-nuclear side was proliferation. What emerged here was that IFR reactors do not produce weapons grade plutonium and there are other more effective means of producing weapons grade plutonium, such as high-speed centrifuge technology. I felt the pro-nuclear side was on shakier ground here since more IFR reactors will lead to more transport around the world of weapons grade plutonium (as a start up fuel) and so the probability of it falling into the hands of terrorists will probably increase. Mark said that nuclear power was 14% of the world's electricity production and declining. Barry offered a bet that the nuclear percentage would increase but Mark declined to accept it. Good move, Barry! So, it boiled down to who was living in the "real world" and who was living in "fantasy world"
3) Make Dan or Anjuli or Cassy or ballerina dance to a beat, using all of their dance shapes. Include a suitable background that changes colours as the lights flash. 7a) One sprite chases another sprite around the stage. The first sprite moves in straight line but bounces off the edge randomly. The chasing sprite chases the first sprite but is moving slower. 12) Draw lines of random thickness in random directions with random colours. The pen must be lifted up and moved for each new line. Hint: colours range across the spectrum (ROY G BIV) starting with red = 0. There are about 190 colours in total and you need to display them all! b) Teacher has supplies a graphic of a keyboard. Import it to your scratch project. OK, I spent 6 years or so teaching at a School in one of the most disadvantaged socio-economic areas in metropolitan Australia. 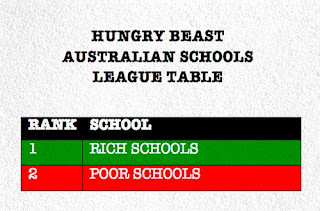 And so I can empathise strongly with how teachers at that school would feel about the new Australian government MySchool site when they see how their low NAPLAN results (Paralowie) are prominently in RED when compared with ALL schools , even though the similar so called like school results are displayed in far lighter shades. Just let me say that Paralowie had the most enlightened administration and the most creative teachers I have ever had the privilege to work with. Teachers who understood that the main source of educational disadvantage was socio-economic and worked very hard to turn things around for as many students as they could. And guess what. It will be the same long after Julia Gilliard has left politics and has retired on her parliamentary pension to some upper class suburb somewhere. is it nuclear or newclear? 2) The only valid alternative to fossil fuels for our energy needs is nuclear power. This is really a matter of doing the arithmetic. According to The Integral Fast Reactor – Summary for Policy Makers (IFR Summary article) , which is written from the POV of keeping CO2 under 450ppm, then we will need to produce 1 GWe per day of new clean power every single day for the next 25 years. 5) If you are not an alarmist but support future human development then you should also support IFR, not so urgently but essential for the future. There is a debate happening in Adelaide, Australia, this Friday presented by The Australian Solar Energy Society, Sustainable Populations Australia and The Zero Carbon Network, will see a debate on “Should we consider Nuclear Power as a response to climate change?” with Mark Diesendorf and Helen Caldicott for the negative and Barry Brook and Tom Blees for the affirmitive (The Nuclear Debate). I've booked a seat. For more information about IFR do some reading from this page of Barry Brooks blog, Brave New Climate.